Many questions have been asked and I will address one of the most frequent: What happened during Obama’s inauguration? In the following, I explain a case study of data from our magnetometer, Maggie, as well as data provided by researcher Roger Nelson from the Global Consciousness Project random number generator (RNG) network. The information from Maggie illustrates the kind of data we are starting to see with the ultrasensitive magnetometer and what it may be telling us. We are on the frontier where new science is created, and we are glad you are on board with us. For those interested in the scientific background, I will continue to explain some more basics behind GCI and the ionosphere and magnetometer data. 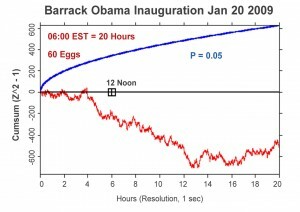 Feel free to scroll down to the data related to Obama’s inauguration if you would like to skip this science. As mentioned in the previous commentary, the Earth is surrounded by a blanket of air reaching over 350 miles into space. The atmosphere is essential for life on the planet. It provides the air we breathe, water is recycled and the ozone layer protects us from the harmful effects of ultraviolet light, which can cause skin cancer. 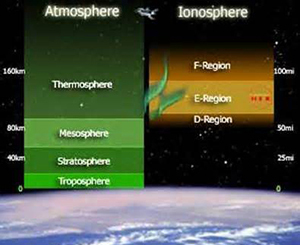 The atmosphere has four layers, the troposphere (about 0-10 miles), stratosphere (about 10-30 miles), mesosphere (about 30-50 miles) and thermosphere about 50-375 miles, see figure from NASA below). Within the thermosphere is a band called the ionosphere that begins about 50 miles out from the Earth’s surface and extends out to about 180 miles. It consists of charged particles. This highly dynamic region is constantly exposed to the full intensity of the sun; harsh ultraviolet radiation is breaking down molecules and atoms. Highly charged ions and free electrons therefore fill the ionospheric layers. A solar storm can pump charged particles into the magnetosphere and ionosphere. 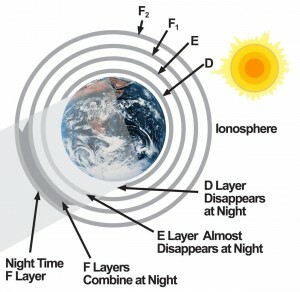 The ionosphere consists of three basic layers: D, E, and two F layers; during the night the D layer disappears, the E layer nearly disappears and the F layers combine (see figure from NASA below). Scientists have found that extreme solar activity drastically compresses the magnetosphere (the protective magnetic bubble carved out by Earth’s magnetic field) and modifies the composition of ions in the near-Earth space. These changes and disruptions in the ionosphere are detected by magnetometers. Such increased solar activity affects the ionosphere, upper atmosphere, and Earth’s weather. This is why monitoring and forecasting its impact on near-Earth space is becoming increasingly critical to safeguarding daily life on Earth. You can watch the effect of extreme solar activity on Earth’s magnetosphere by following this link:www.physorg.com/newman/gfx/news/hires/watchingsola.gif. Schumann resonances (SR) are the electromagnetic frequencies of the Earth-ionosphere cavity (see figure below) and were first predicted by W.O. Schumann (1952). Electromagnetic impulses, like those from global lightening flashes (the world’s thunderstorm activity) fill this cavity and excite the Schumann resonances. Resonances can be observed at around 7.8, 14, 20, 26, 33, 39 and 45 Hz (See the live data). The observation of Schumann resonances can provide valuable information about solar activity, world thunderstorm activity, properties of the upper dissipative boundary layer, the Earth-ionosphere cavity and climatic changes. It has been found in previous studies that the Schumann resonances can influence human health indicators such as blood pressure, and it is likely that they also affect cardiac and neurological disease, violence and war, some of which was discussed in my last commentary. An RNG is an electrical device that randomly produces a sequence of numbers – either 0 or 1 – 200 times a second) which should be a random string of numbers that equal out to 100 0’s and 100 1’s and that results in a flat line when they are all added together. Roger Nelson started the Global Consciousness Project when he was at Princeton University and is a collaborator with the GCI (http://noosphere.princeton.edu/). During events in which millions of people share emotions globally such as Barack Obama’s Inauguration, many people seem to come into alignment, or coherence.. In this case, the random production of 0’s and 1’s from 65 RNGs at host sites in 41 countries went out of balance: Small, but meaningful differences from expectations can be seen in the data (for example, more 1’s than 0’s were produced or more 0’s than 1’s). This is also true for events in which the power of group focus such as during meditations has been applied intentionally, with the goal of having a positive impact on troubled areas on the planet, whether it is a war zone or an area struck by natural catastrophe. Although RNG data can detect imminent events, it does not tell us what is in store. To help us better understand the global impact of Obama’s inauguration, we will examine the RNG data from the Global Consciousness Program (see figure 1. below) and our “Maggie” data. Figure 1. Shows the network variance of the Global Consciousness Project’s random number generator network before, during and after the inauguration of President Obama. The formal event specification for the inauguration was extended both before and after the swearing-in, attempting to capture the anticipation and the celebration of the estimated 1.5 to 2 million people in Washington D.C., and hundreds of millions watching the ceremonies on TV around the world. The event was set for 6 a.m. on the 20th to 2 a.m. on the 21st, EST. The result is graphically quite striking, with no trend for the first four hours. Then there is a very steady trend showing smaller than expected network variance for about 12 hours, and finally a change to a period of relatively large variance. For a more detailed explanation, go to the Global Consciousness Project Web site at http://noosphere.princeton.edu/. The following two graphs show some preliminary data from Maggie, the magnetic field detector developed by the Global Coherence Initiative research and development team to monitor the resonances occurring in the plasma waves constantly circling the Earth in the ionosphere. Figure 2. This is a plot of daily spectrograms of the Schumann resonances for the four days before, day of and three days after President Obama’s inauguration. The intensity levels of the resonances are substantially lower the day of and the days following the inauguration than the days preceding it. Figure 2 is a frequency-time spectrogram of the horizontal component of the Schumann resonances. Within the spectrograms, the power of the intensity at the right side of Figure 2 of a given frequency is coded in a color scale, with yellow being the most intense. The typically daily variations in the intensity of the resonances can be seen in the figures. The time of the presidential swearing-in at 12 p.m. EST on the 20th is noted by the red arrow. At the left of Figure 2 is a vertical section through the spectrogram showing the typical resonance structure for Jan 16 on the upper row and Jan 20 on the lower row. The resonances are shown by the red lines that appear as horizontal lines with frequencies of 7.8, 14, 20, 26, 33 and 39 hertz. The daily time periods shown in each daily plot are 10 a.m. to 4 p.m. PST. The grey boxes were added to omit the data that was contaminated on several of the days by a local noise source – a solar charger that was being eliminated. Figure 3. This shows the total spectral power in the frequencies between 5 and 40 hertz for the same days shown in Figure 2. GCI researchers note that an interesting observation of this data is the pronounced change in the activity level of the resonances. 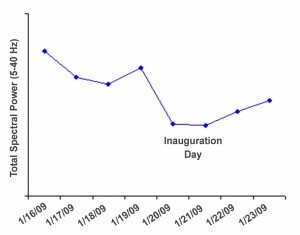 As shown in both figures, there is a pronounced drop in intensity on the day of the inauguration that persisted during the three days following it. The GCI research team has been exploring changes in space weather and other indicators of ionospheric activity such as ion density that could explain the changes in resonance intensity. So far, the changes do not appear to correlate with other indicators that are known to affect ionospheric activity. However, it is possible that we are seeing an effect of human consciousness acting on global weather patterns. Similar observations were made during another event, World Sound Day, on Feb. 14 of this year, but we are still exploring the data. Data comparable to Obama’s inauguration for RNGs and Maggie were obtained. This was a day when people around the planet took five minutes to send a sonic Valentine to the Earth with the heart sound “AH,” which was filled with the intention of peace and love. Obviously, so far we can only speculate about the meaning of the data, and we are excited about continuing this interesting journey of helping to increase global coherence. Might the alignment of many millions of people in most countries of the world cause a quiet period in the magnetometer data? Does the data correspond with uniting the emotions of many, allowing for more global peace and harmony? Because solar storms increase the intensity in the level of resonance, which in turn causes health challenges, violence etc., the data could be a first indicator that we are taking the right steps with our innovative research in monitoring the ionosphere. So far we have taken an exploratory look at the possibility of global events being the catalyst for the kind of coherence that we think of as a global consciousness. A word of caution, however: Our research team knows that to scientifically prove our theory, the real effect only can be identified by repeatedly monitoring events that have similar impact. "The mountains, rivers, earth, grasses, trees, and forests are always emanating a subtle, precious light, day and night, always emanating a subtle, precious sound, demonstrating and expounding to all people the unsurpassed ultimate truth."